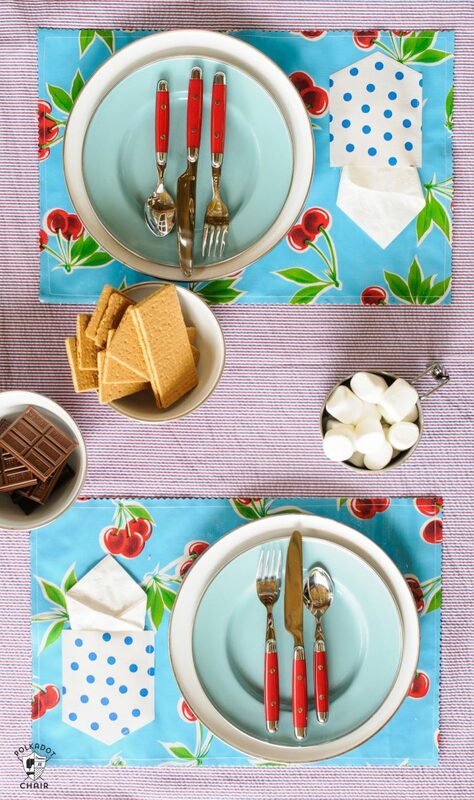 Keep your napkin from blowing away when you’re eating outdoors with this cute and functional Oilcloth Placemat! 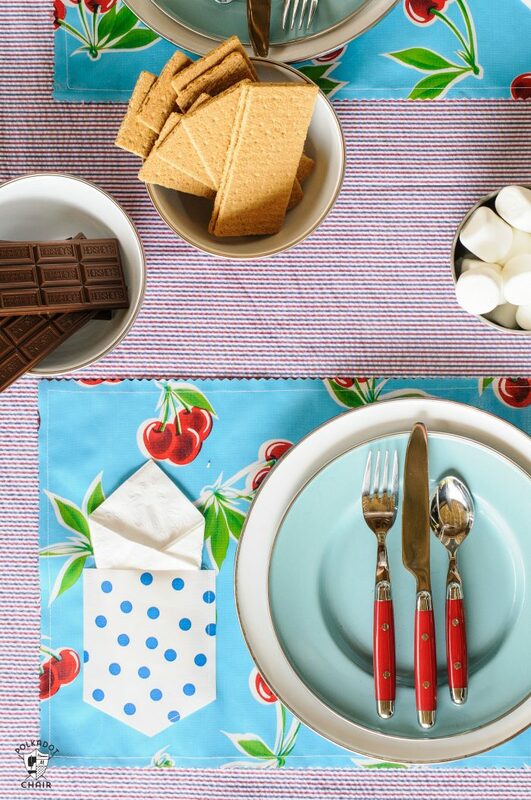 Keep reading learn a few tips and tricks for working with oilcloth and how to make placemats with pockets perfect for the Outdoors. 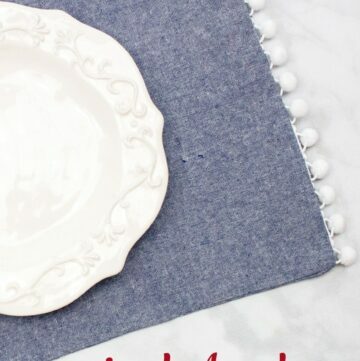 If you like this project you may also like this roll up chalkboard placemat sewing tutorial. I took a good look at our deck last week. The weather is warming up and pretty soon we will be eating dinner outside again (hallelujah!). It was the first time I’d really looked the deck over since Fall. I was trying to “access” how much grime had built up over the winter. What I found was not pretty. The thing is looking pretty dirty. I foresee a weekend of power washing in our near future. 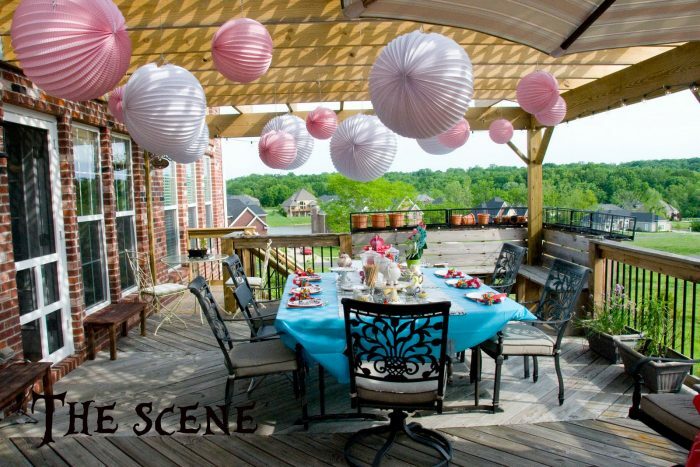 I love our deck, it has a great view of our neighborhood and a pergola on top to filter the harsh afternoon sunlight. I try to eat dinner outside each evening that the weather is cooperative. Even though we keep the table on our deck pretty well cleaned off, I noticed that it gets a bit dusty and I like to have a set of placemats to use when we eat outside. I was using plastic placemats until one day the pattern from the placemat MELTED into our tabletop! What’s worse, is that they were Thanksgiving placemats! We ended up with turkeys all over the top of our table. Note to self; hot temperatures and plastic placemats DO NOT MIX! We managed to get the turkeys off of the table, and ever since then, I’ve been more careful with what we use outside. 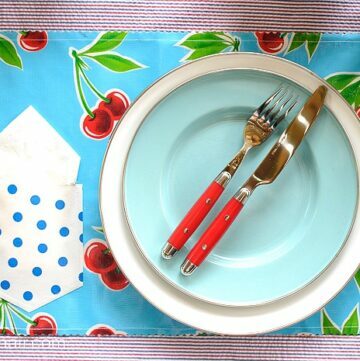 A few years ago I made a set of Oilcloth Placemats to use when we eat outdoors. They are easy to store and easy to wipe off. I even added a pocket to them to hold my napkin. I hate it when it blows away while I’m eating! To keep it simple, to finish the edge of these placemats instead of sewing on bias tape, I just pinked the edges. 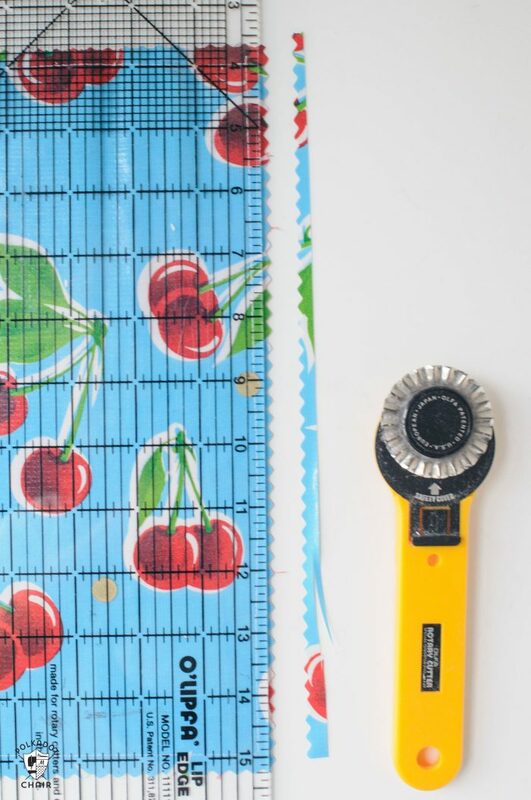 The oilcloth is pretty easy to sew with you just need to know a few tips, which I’ll share with you today. Are you ready to make some?? 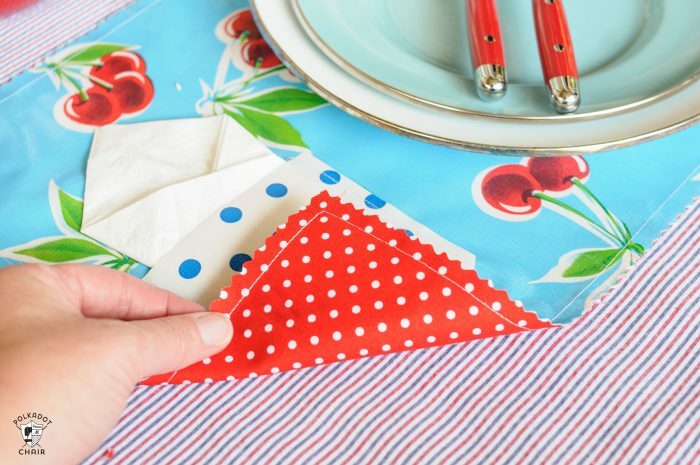 To begin cut out your oilcloth for the placemats. 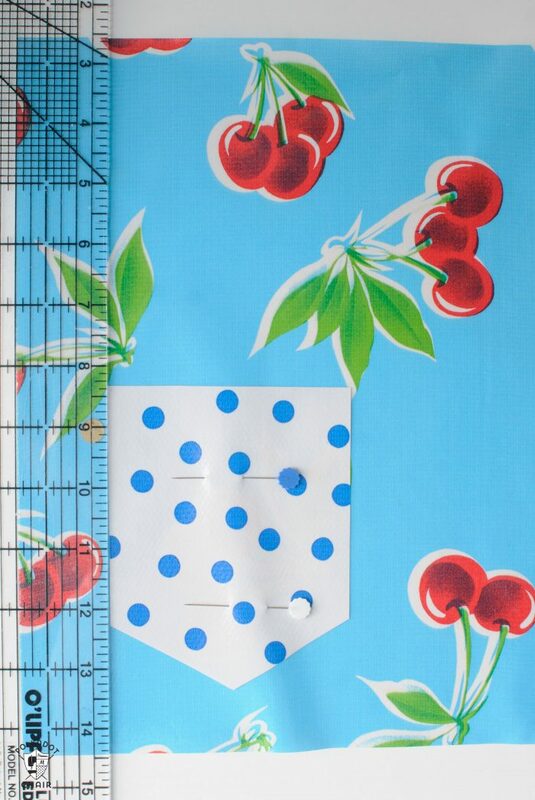 Each piece is 12″ x 18″ you will get the most yardage if you cut your oilcloth 12″ wide then into 18″ sections. 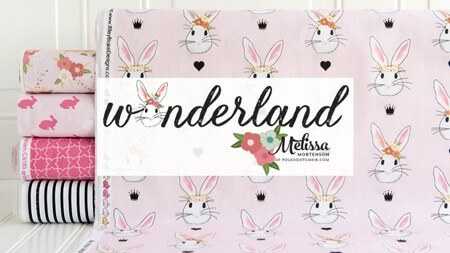 Cut out your lining fabric, it’s also 12″ x 18″ but for this fabric cut it 18″ wide then cut that strip into 12″ sections. 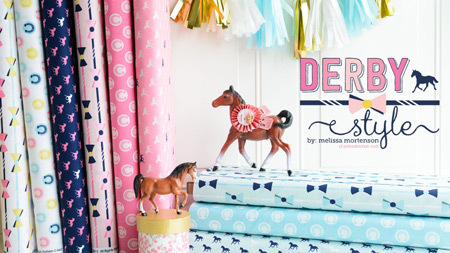 Normally I would tell you not to pin oilcloth, but this time we’re going to have to. 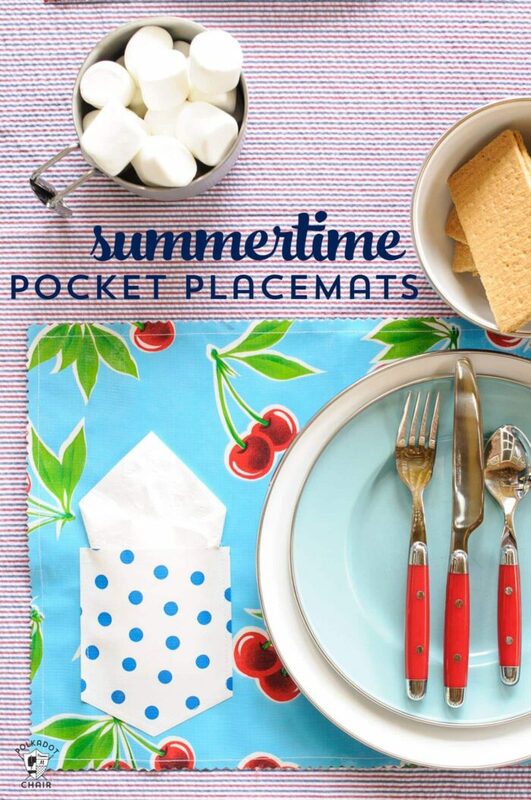 Using two pins, pin the pocket to the placemat front 1 1/2″ in from the edge and 1″ up from the bottom. Stitch pocket to the placemat. Make sure you have the Teflon foot on your sewing machine for this ENTIRE project. 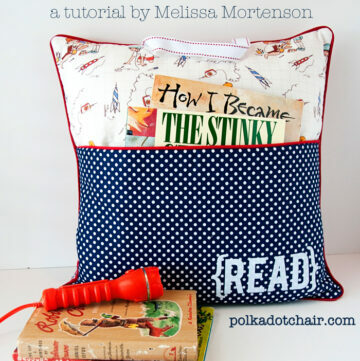 Using your glue stick put a bit of glue on the center of 12″ x 18″ lining piece of fabric. 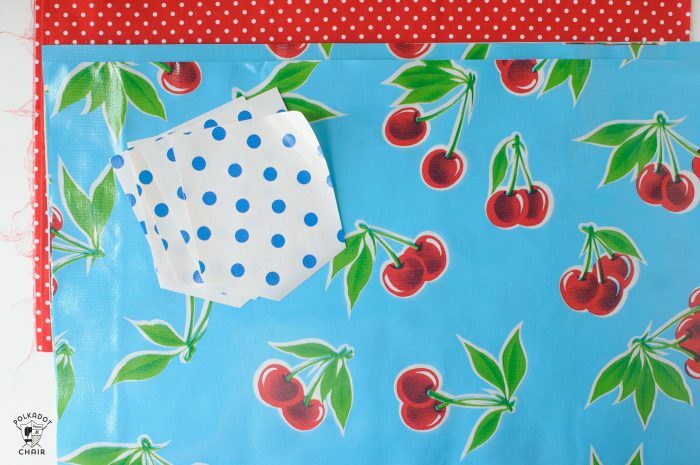 This will help keep the lining from sliding around while you’re sewing it to the oilcloth. 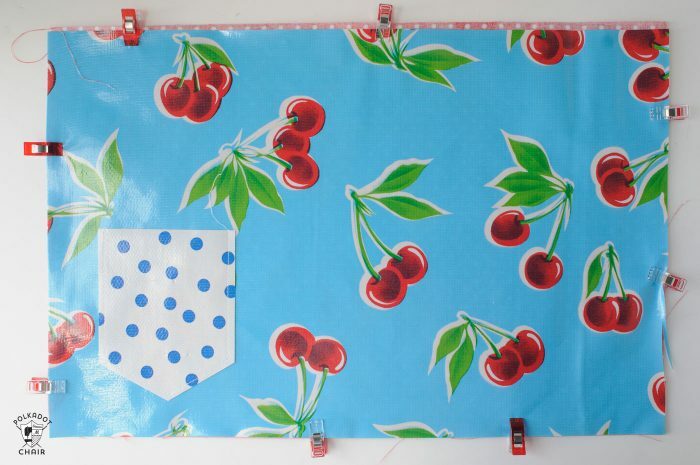 Glue the lining to the back of the oilcloth… wrong sides together. Secure with binding clips. Stitch around the edge of the placemat (oilcloth facing up) using a 1/2″ seam allowance. Using your quilt ruler and the pinking blade on your rotary cutter, cut off the edge of the placemat 1/4″ out from the seam you just stitched. Clip your strings, and you’re done! Thanks for the tutorial! Looks easy enough for even me to do!! 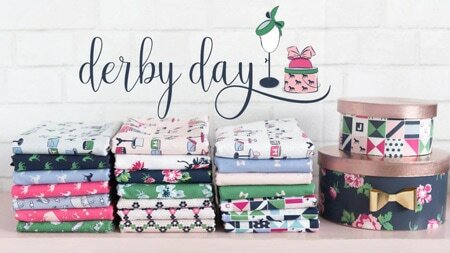 Do you think home dec weight or canvas would work for the backing fabric? 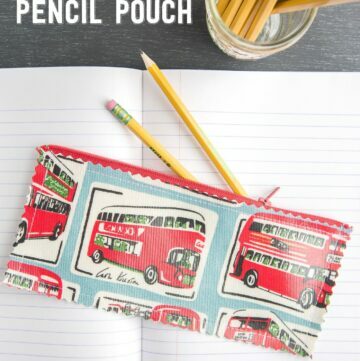 And wouldn’t glue stick (or something else sticky like sticky tac) work for securing the pocket for sewing? Or what about taping all pocket sides down except for the edge you’re sewing on, then removing tape as you sew the next sides? Those are really cute and I love the pocket. That was a great idea. 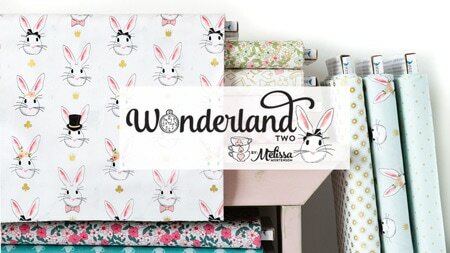 I have thought about making a cushion cover for the outside bench out of oilcloth. What settings do you recommend on machine. Never used oilskin before. 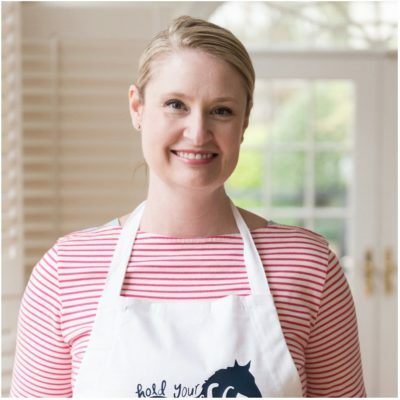 I’ve been making oilcloth aprons and have extra oilcloth left over. 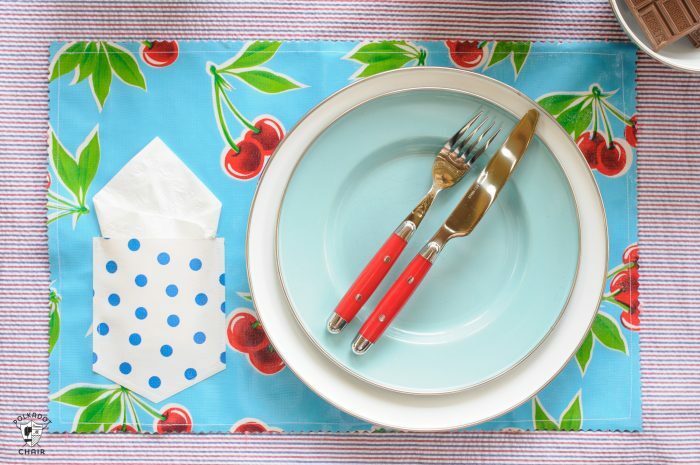 I want to make placemats with oilcloth on both sides. Trouble is the oilcloth print from the other side shows through on the ones with a white background. Should I put a third layer in between, such as canvas? I think canvas would be too thick. I’d try a sew in interfacing and see how that works. It also will not fray.